Response: We studied Medicaid-enrolled youth aged 13-22 from 11 US states and identified approximately 4800 youth diagnosed with opioid use disorder between 2014-2015. Even after being diagnosed and presenting for care, only 1 in 4 youth overall received an evidence-based medication. 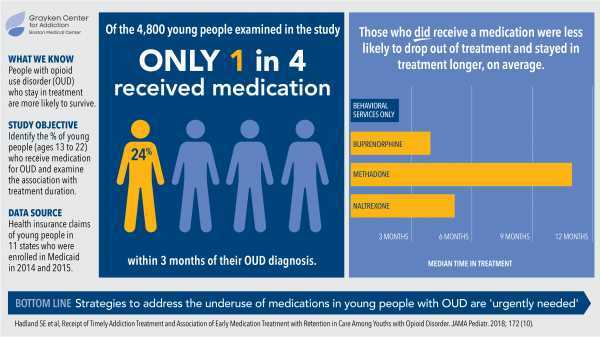 This gap was substantially larger for adolescents, among whom only 1 in 21 received a medication. Most youth received only behavioral health services (e.g., counseling, group therapy) for treatment. Yet, when youth received medications, they were more likely to remain engaged in treatment. Youth receiving only behavioral health services typically left treatment early after only 67 days. However, youth receiving buprenorphine typically stayed in treatment 123 days; naltrexone, 150 days; and methadone, 324 days. So, our results show that youth are at once unlikely to receive evidence-based treatment and more likely to be retained in care when they do. Response: Readers should know that there is a large addiction treatment gap for young people, and also that medications for addiction treatment are effective and, based on our study, help keep youth engaged in care. That many youth do not receive the standard of care flies in the face of current clinical guidelines from the American Academy of Pediatrics and the American Society of Addiction Medicine, among other national bodies, all of whom recommend that young people receive the same evidence-based treatment as adults do. Response: Future work should determine the extent to which the improvement we saw in retention in care was due to the medications themselves vs. the systems of care in which they are delivered. For example, it is known that buprenorphine is a highly effective treatment for opioid addiction. 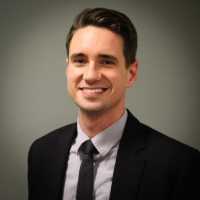 Yet, it is additionally possible that treatment programs that offer buprenorphine provide higher quality care than treatment programs that do not offer it (since treatment programs offering buprenorphine are adhering to national standards of care). This entry was posted in Addiction, Author Interviews, JAMA, Opiods, Pediatrics and tagged addiction, Adolescents, BU, JAMA, medical research, opoid, The_BMC by Marie Benz MD FAAD. Bookmark the permalink.